It might seem strange developing flooring for dementia sufferers, but that is exactly what Polyflor have done.Their Polysafe new Verona Pure Colours collection features a specially engineered emboss and unique matt finish, using complementary coloured quartz in the vinyl to harmonise with the base shade and generate enhanced sustainable slip resistance. 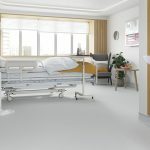 The result is an aesthetically appealing safety floor that looks like a smooth vinyl with virtually ‘invisible’ slip resistance once laid on the floor. 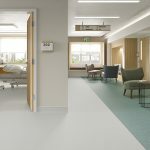 Polyflor worked with the Dementia Services Development Centre (DSDC) at the University of Stirling to assess the suitability of the Pure Colours collection for specification as a flooring for dementia sufferers. The DSDC is an international centre of knowledge and expertise dedicated to improving the lives of those living with dementia which offers a product accreditation scheme which rates products on a tier scale. 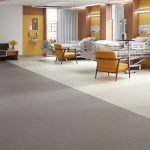 The Polysafe Verona Pure Colours collection performed exceptionally well with 14 colours achieving the highest 1a rating and 4 colours achieving 1b. Further information on the scheme is available on the Polyflor and DSDC websites. The Pure Colours collection adds a contemporary new design to the well-established Polysafe Verona range. From the outset the goal was to develop a product that responded to the market demands for a plain & tonal decoration and also for the collection to be well suited to specification within dementia friendly design schemes. For added reassurance of low maintenance in hygiene critical areas, Polysafe Verona features the renowned Polysafe polyurethane reinforcement (PUR) cleaning enhancement. Cross-linked and UV cured, Polysafe PUR is a super strength reinforcement designed to facilitate even easier cleaning, whilst providing optimum appearance and colour retention as well as improved soil release. Using a micro mop maintenance regime, chemical usage, energy intensive cleaning and water consumption are significantly reduced and life cycle maintenance costs of up to 60% are achievable when compared to untreated safety flooring. Polysafe Verona PUR contains recycled content through the use of natural recycled aggregates and is 100% recyclable via the Recofloor scheme.